Sunny hours have a protective effect on the risk of asthma in schoolchildren; the more time in the sunlight, the less the risk of asthma. Low sunlight exposure may be the reason for the worldwide epidemic of asthma. Low sunlight exposure correlates to high risk of Crohn’s disease. Summer sunlight exposure correlates to a reduced risk of breast cancer among women of any age. Canadian women who spent more than 21 hours per week outdoors had an average risk reduction of 29% compared to those who spent less than 6 hours per week outdoors, and those in the age group 60-74 had a risk reduction of 50%. Girls with the greatest exposure to sunlight during the ages of 10-19 had a 35% decreased risk of breast cancer as adults . Women who live in the sunniest areas and have the highest exposure to sunlight have a 65% reduction in breast cancer risk compared to those who have the least sunlight exposure. Exposure to sunlight and tanning beds correlates to a substantial reduction in the risk of endometrial cancer. 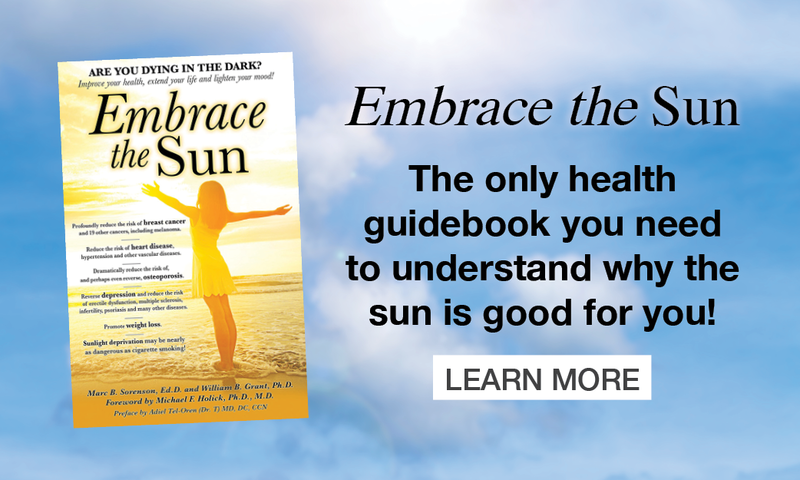 People who receive more than 5 hours of sunlight exposure on the weekends have a reduced risk of melanoma of 33% compared to those who receive less than 4 hours per day. Active sun exposure habits are correlated to a lower risk of type-2 diabetes in women. Active sunlight exposure habits correlate to a lower risk of venous clotting in women. Sunlight exposure may improve the immune system with mechanisms other than the effects of vitamin D production. Low sunlight exposure, combined with the effects of a the Epstein Barr virus, may increase the risk of MS.
Ultraviolet radiation (also found in sunlight) suppresses experimental MS independent of vitamin D production. Women in Spain who actively seek sunlight exposure have a reduced risk of fractures of 91%! High sunlight exposure correlates to 77% reductiion in the risk of hip fractures in Alzheimer’s, stroke and Parkinson’s patients. Sunlight exposure for one year leads to increased vitamin D levels, increased bone mass and a 73% reduction in the risk of hip fractures among Parkinson’s patients. Several studies show that the greater the amount of outdoor activity in natural light, the less the risk of Myopia. Visit the VIDEO GALLERY for more great clips.